Packet jelly is usually limited to the bright reds of strawberry and raspberry, making blush-pink rhubarb jelly a particularly elegant option. Creating a jelly using British rhubarb would make a lovely layer in a traditional trifle but there’s no need to limit its application to sweet desserts. Look further afield to our continental neighbours for inspiration - rhubarb jelly can be used as a twist on a traditional membrillo, making a lovely addition to a cheeseboard too. Do not boil the gelatine as it can affect the jelly’s setting ability. If you can't get hold of bronze gelatine you will need to adjust the quantities for powdered. Take a look at our guide on How to make rhubarb purée to see how different flavours can be introduced to the rhubarb at the poaching stage. From infusing the puree with star anise to substituting the water for orange juice, there are lots of ways to put a subtle twist on a straight rhubarb recipe. Galton Blackiston’s jelly and ice cream recipe demonstrates that one of the easiest and most nostalgic ways of serving jelly - with a simple scoop of vanilla ice cream - is just as good for a grown up lunch as it is for a children’s party. 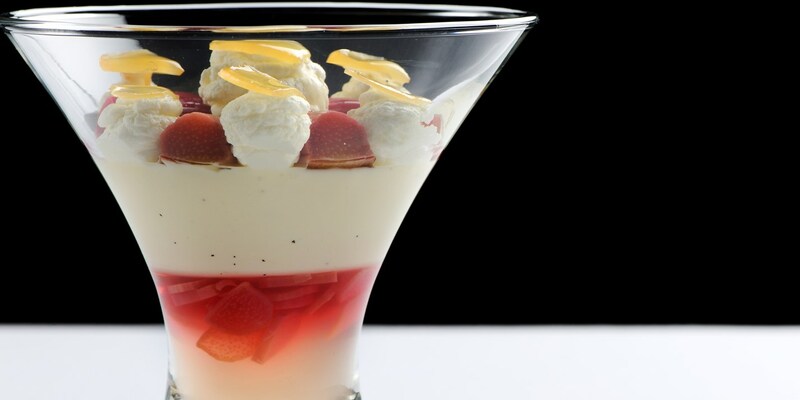 A traditional trifle is another classic, with rhubarb jelly being a natural partner to custard and cream.